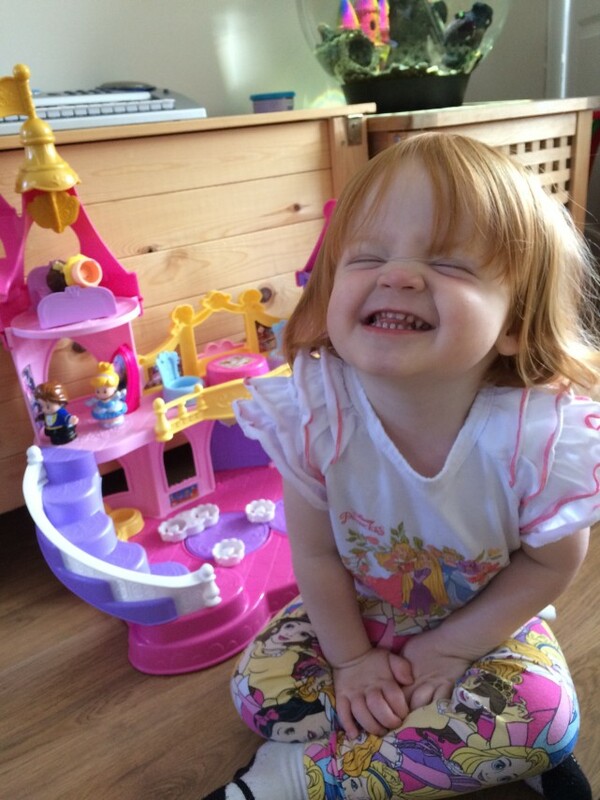 Aria is a huge Disney Princess fan and a huge Little People fan, combine both and you have a winner in her eyes. 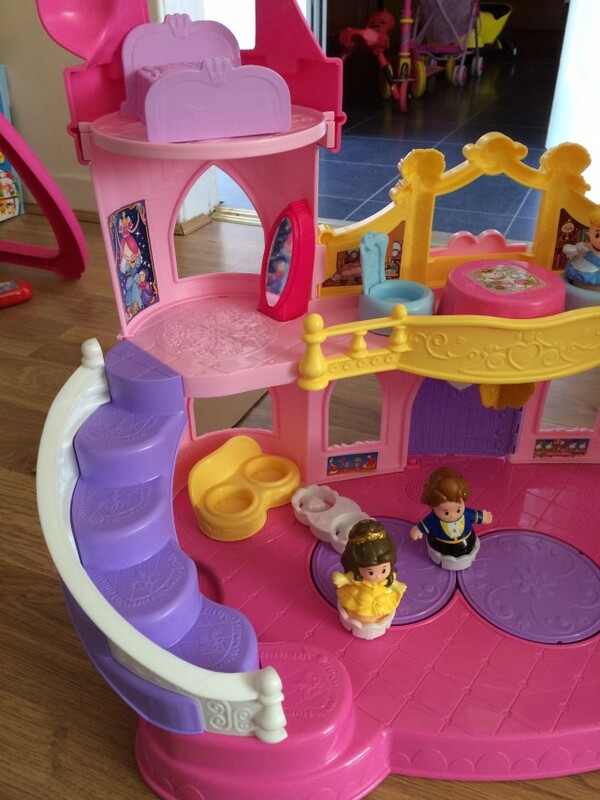 From the minute the Fisher Price Little People Disney Princess Musical Dancing Palace arrived she was desperate to have it built. Like all Fisher Price products they come with excellent instructions and are simple to build. You will need a Phillips head screwdriver and 3 AA batteries to complete the build. The bits clip together and it’s pretty intuitive, there are a few screws to put in place to hold it all together. From start to finish I’d say about 10 minutes. I did follow the instructions, yes I did and it helps when it comes to putting the stickers in the right place. They are all numbers. Next was 3 AA batteries and we were ready to have some fun. 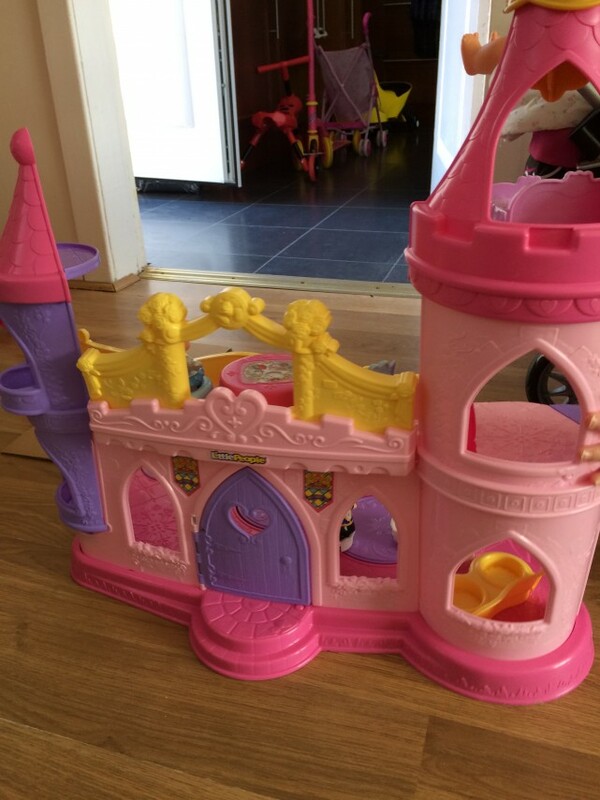 The castle has been designed in bright colours of purples and pinks, with chunky furniture and characters, perfect for little hands. 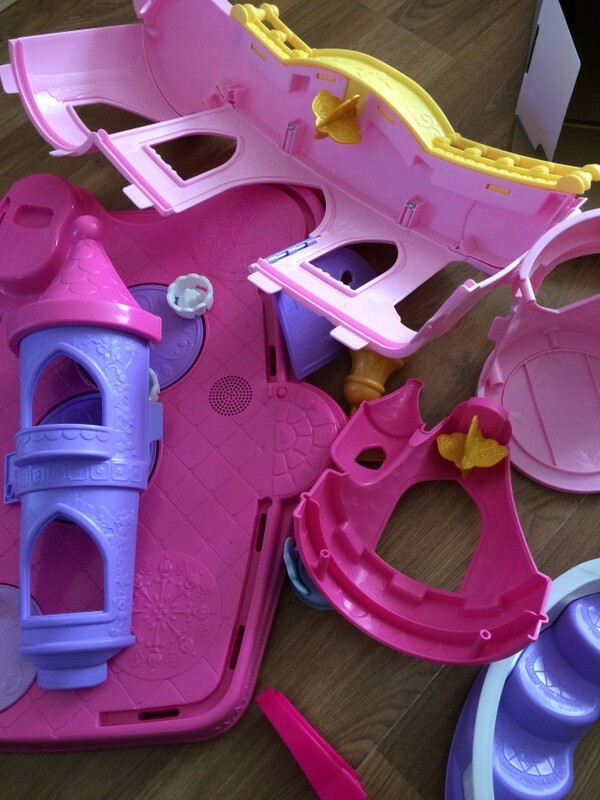 The Fisher Price Disney Princess Castle is for ages 18 months and up. Aria is 2 1/2 and she’s a great age for this. I would say they have the age right. There are no little bits to get lost or put in their mouth. It’s simple, easy to use and the colours are attractive to little minds. The set comes with Princess Belle, Cinderella and the Beast in Prince form. Each recognisable from their films. We already have a lot of the Fisher Price Little People Princess, Prince and Snow White characters, they are excellent. Great for toddlers and imaginative play, they recognise the characters and are chunky enough for little hands. Also with the set is a table and chairs, a bed and a two seater chair. Everything required for your castle to come to life. Aria had a lot of fun placing the characters on the twirling dance floor and spinning the lever to watch them dance around to music. Be careful not to spin it too fast or the characters come flying off. There are a couple of songs, one being the beauty and the beast song which is love and very sweet and the wonderful Bibbity Bobbity Boo song from Cinderella. You will find yourself singing a long. There are also a few phrases and a tune plays with the door to the castle is opened. Aria loved walking them up and down the stairs, putting them to bed and they even have a little tea party together. The mirror is another great addition. The Disney Princess Castle has everything needed for some imaginary role place with some of the most beloved characters. 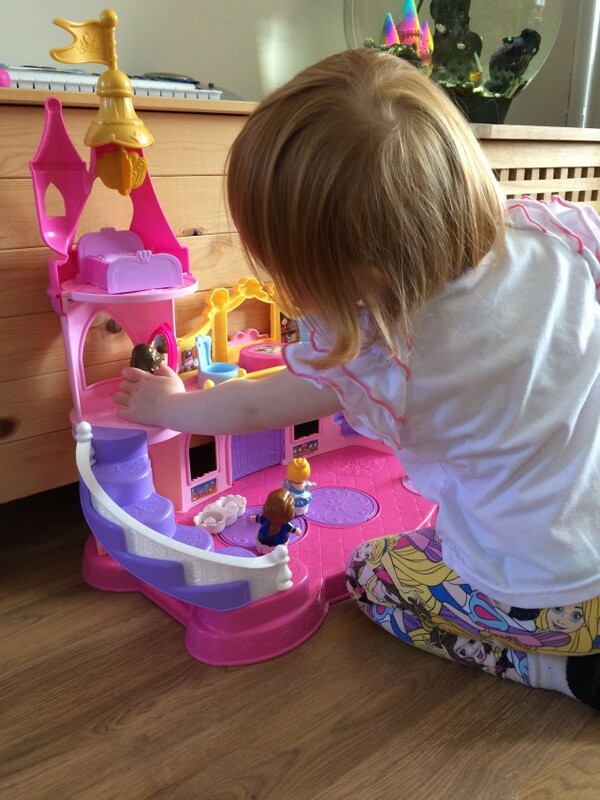 Aria is a huge fan of the Fisher Price Disney Princess Musical Dancing Palace, she adores the figures and spinning them around on the dance floor while the music plays. It doesn’t even get annoying, it’s not loud and it’s actually very sweet. I have had so much pleasure from just watching her play with it. She chats and plays out different scenarios with her princesses and the prince, it’s adorable. It is designed with little ones in mind and it comes across. This toy gets a huge thumbs up from us. We love Fisher Price and this did not disappoint. 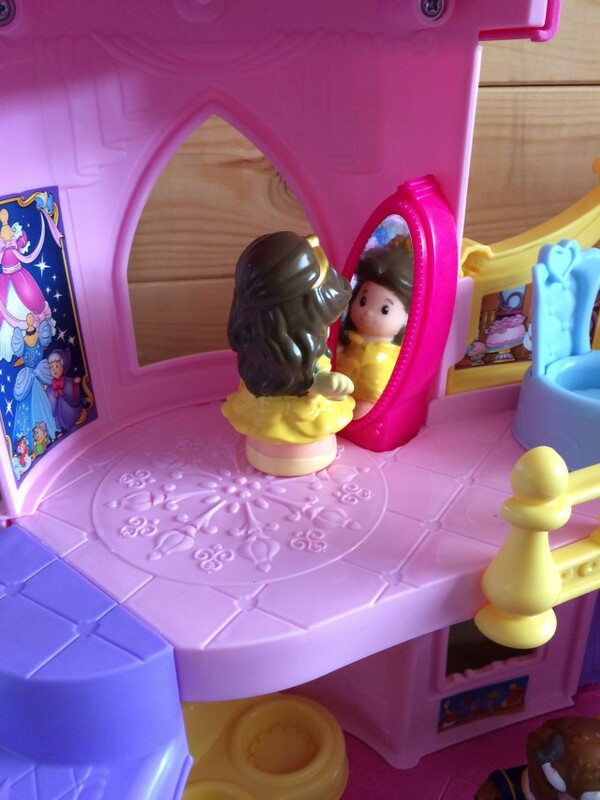 Any little Princess fan will love to play with this. Disclaimer:- We were sent the purpose of this review, but all thoughts are my own. aaaa my youngest would love this, we have the cinderella carriage and it gets played with constantly!! It’s a lovely toy and looks like it would keep a little one entertained for quite a while. It’s my friends daughters first birthday soon so might look at this!